Today's highly productive working environments require efficient and reliable material handling. Single Girder Suspension Cranes offer just that by the use of the unique low deadweight profile design and flexible bridge system. 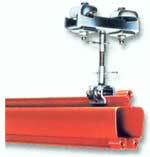 In addition, the low deadweight allows the system to mount directly to the building structure. Finally, the smooth running trolley characteristics in conjunction with the light weight provide the confidence that heavy, awkward and sometimes delicate parts can be precisely, reliably, and safely positioned. 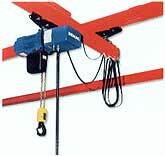 Occasionally loads exceed the limits of a single girder crane or require additional headroom in close quarters. A double-girder crane has the versatility to accommodate such requirements due to its low deadweight and optimal dimensional characteristics. The exclusive pendulating suspension design absorbs horizontal forces caused by starting and stopping, traditionally induced into the support structure. The unique design of the double girder arrangement allows the crab to stool the hoist between the girders increasing the overall headroom dimension. The double girder crane also enables the system to span large areas over several runways covering extensive storage or production areas. The low deadweight and low friction trolley wheels allows the operator to move a significant load manually. In the event the span exceeds the operators or standardized limitations, the system can be easily fitted with electric travel drives on all motions. When a work area must be free from any support structures that may interfere with operations, ceiling mounted bridge cranes are an excellent solution to keeping floors clear. Cranes can simply be suspended from the building roof or superstructure. Additional supports for the crane runway are not necessary. 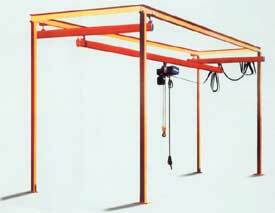 Even partial areas of a workshop may be easily fitted with suspension cranes at low cost. Handling capacities up to 4000 lbs. with overall bridge lengths up to 34 ft., these systems are pre-engineered and modularly designed for easy installation, expansion, and relocation. Customers can install multiple bridges along one set of runways and greatly increase their productivity. • Available in steel, aluminum, and stainless steel. • Capacities from 250 lb. to 4000 lb., with spans up to 30 feet. • Easy to install, move, and position. • Support steel doesn't interfere with the handling operation. • Require buildings with adequate overhead structures. Do you also want to move loads beyond the limits of your crane suspension? We can make this possible. later date, for example. These cranes can even handle loads below ducts, radiant heaters, pipes or similar obstacles between the wall and roof which result in the crane runway having to be positioned at a distance to the wall. Extending cranes feature additional girders that are arranged between or beneath the crane girders. Depending on the design, they can be extended to one or both sides beyond the crane runway width. These cranes can also be used for lifting and positioning loads in almost inaccessible areas, such as between pillars and columns.